With the HMG10P / PMG10P series, Baumer raises the bar for HeavyDuty encoder technology. The encoders enable convenient configuration by any input device via WLAN adapter for individual configuration and device parameter optimization on site. Whether it comes to container cranes, lifting platforms or steel plants – system uptime is a top priority. 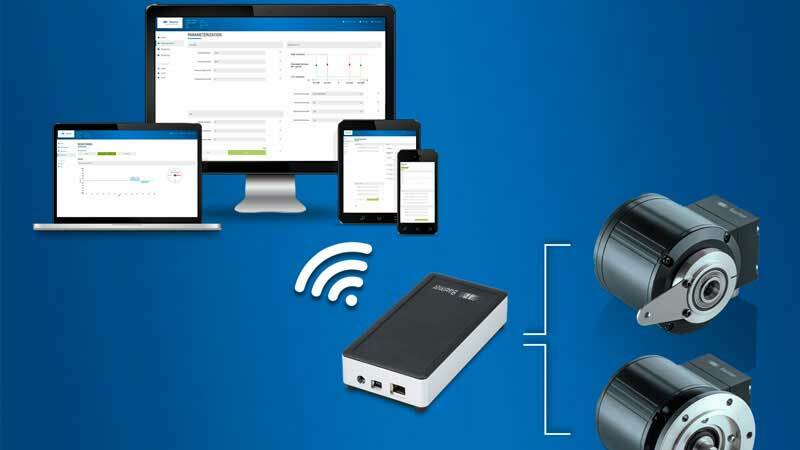 The compact WLAN adapter helps system builders, service technicians and distribution partners configure the encoders quickly and intuitively via Ethernet or WLAN using PC, tablet or smartphone. The integrated monitoring function clearly visualizes the ongoing encoder signal transmission and simplifies commissioning. Documentation is made easy by parameter download and password protection prevents unauthorized access. For decades, Baumer HeavyDuty encoders have been proving their reliability and unrivalled robustness in harsh, very aggressive environments. The absolute multiturn encoders HMG10P / PMG10P in ultra-resilient HeavyDuty design by Hübner Berlin set new standards in durability and precision thanks to bearings at each shaft end, innovative magnetic sensing and the proven and patented multiturn counter Baumer Energy Harvesting. Now, thanks to the WLAN adapter, the outstanding flexibility of these encoders can be used to an optimum. Besides the absolute position output, the HMG10P / PMG10P encoders feature two incremental signal outputs with zero pulse and integrate a speed switch. The absolute SSI position resolution, the incremental resolution from 1 to 13‘1072 ppr and the switching speed from 2 to 12‘000 rpm can be freely configured. In combination with the great number of fieldbus, mechanical and signal interface options there is virtually unlimited flexibility.